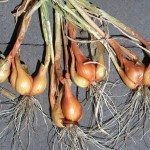 This article (https://www.gardeningknowhow.com/edible/vegetables/shallot/planting-shallot-sets.htm) says plant the bulbs 1 inch deep. Is this the depth from the topof the bulb or the bottom of the bulb? The soil line should be 1 inch from the top of the bulb.